Onsite activities include boating, canoeing, nature trails . . .
1 bedroom with double bed and shower,lounge with sleeper couch,own entrance. 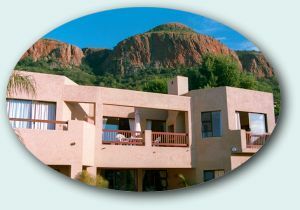 It also has a top deck above the suite with the best view of the dam and mountain where you can have an intimate private braai or simply take in the wonderful view. 2 bedrooms, 1 with double bed and bath, 1 with 2 single beds and shower. Large lounge and open plan kitchen, balcony overlooking the dam and private braai area. Private entrance with lounge interleading into bedroom. Jacuzzi bathroom on suite with own special view of the dam. Separate shower and toilet. Own balcony area and stairs down to the pool. 2 bedrooms, 1 with bath, 1 with shower. Lounge and open plan kitchen, separate entrance to own parking, all with direct view onto the dam. Suitable for families and kids.